I decided to take it easy, just laying on the hotel beach for the whole day then take a squid fishing trip in the evening for a few hours. 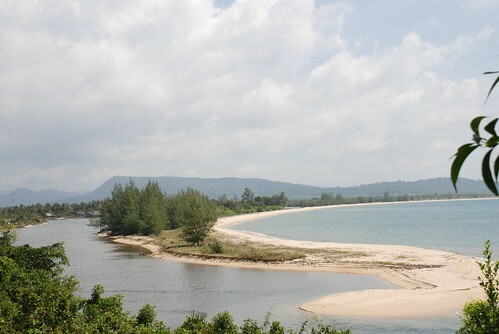 The beach is really quiet not because I am the first one on the beach at 8am but that's just the atmostphere on Phu Quoc. There were only a few hotel staff hanging around cleaning and collecting rubbish and organizing chairs for hotel clients. 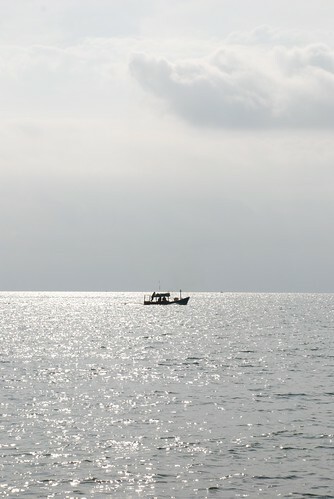 I saw a few people driving their small fishing boats setting their nets along the beach then they stopped in front of my hotel before starting to pull the net from two different places which were about 2 kms long between each other. They were working so hard but they smiled all the time which is really nice. I saw quite a few kids around both on the boat and on the beach with their families trying to help pick up the fish and put water into the big fishing boxes. I'm sure they should be at school but I suppose their parents need them to help earn the family income. So, I spent around three hours watching the activity of these people fishing at the beach then I decided to hire a motorbike and drive into town, check out everything and take some photos around the central market. 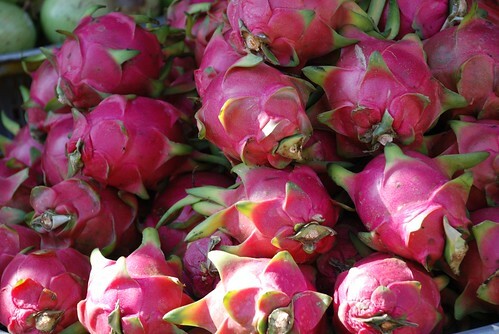 The market was very interesting with a variety of food, mostly seafood with lots of huge fish, prawns and squid. People were posing for me and kept asking me to take more photos of them. They were laughing out loud when I showed them their own faces. This doesn't happen much in Vietnam. Normally people object to me when I want to take their picture. I also stopped at a fishing village near the market and it reminded me of the fishing villages near Nha Trang but much smaller. The standard of living around these areas seemed not very high as people rely mostly on fishing and working in the market or being a motorbike taxi but they seem very happy with their lives. 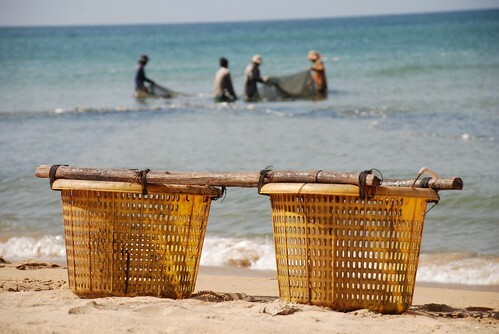 There are lots of smile in Phu Quoc. My trip to the south of Phu Quoc was pretty good as I visited some interesting places such as very famous dog supply, pearl workshop and some souvenir shops. 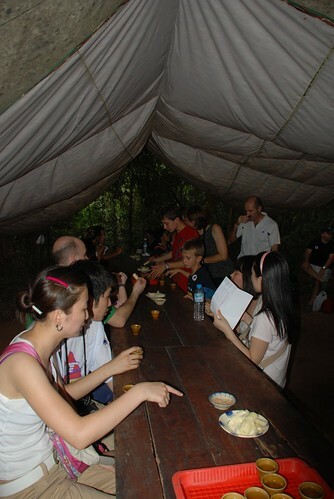 The most disappointing place was Phu Quoc prison which is not what I would call a tourist attraction. The people who take care of this place were eating in the entrance way on the floor when tourists were there, their kids were crying and shouting all over this place. How disappointing! It has quite a lot of potential if it is managed better. 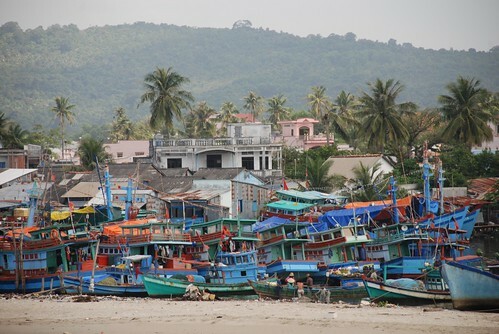 I also went to the old port for some shots before heading to the most beautiful beach in Phu Quoc named Sao - Star beach. 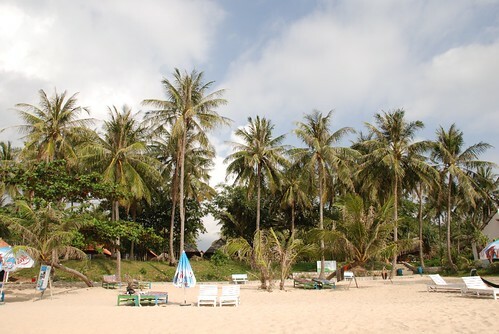 This is truly a beautiful long white sandy and wild beach with lots of coconut tress along it. I had a really nice seafood lunch there for only $15 including a cold 333 beer, grilled prawns with salt and black pepper, steamed squid with ginger, stir fried shell fish with lemongrass and black pepper and salad. I felt regret that I didn't swim there as I forgot to bring my swimming shorts. Perhaps I should have gone in my underwear! On the way back, the driver intended to show us a waterfall but I wasn't in the mood for that as I was a bit too tired to climb up to the waterfall and I decided to go back to the hotel for a cold shower then head to the beach to relax and swim. Finally, we got back hotel and I was so pleased with my room right on the beach with two bathrooms, one inside and one outdoor. I love having a shower outdoors which is nicer and cooler. After a long morning, I finally made it to the beach and had a swim for 30 minutes. It was so great swimming in the cool blue water that was so refreshing. In the evening, I hired a motorbike to drive down to town for dinner and stopped at the night market that is opened mainly for tourists. There are lots of local restaurants and bars there as well. I chose a shop in the middle of the market, which serves BBQ, hotpot and the specialties of Phu Quoc, meaning lots of seafood. They cooked it really well and people working in the shop were so nice and sweet. 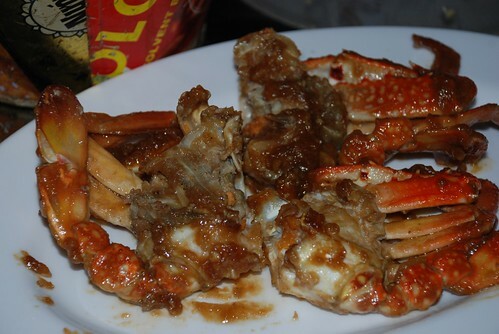 I had two cold beers, a small seafood hotpot, grilled squid, steamed crab and crab with tamarind sauce. The food was so yummy and I could have eaten more even though I had already had too much. 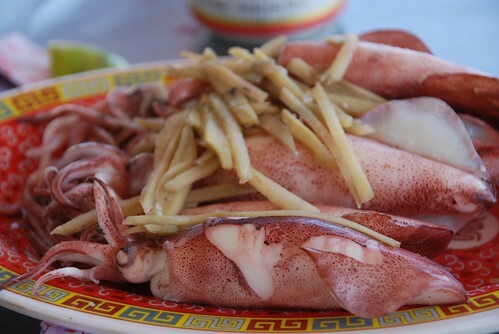 Compared to Hanoi, Saigon and even Nha Trang, the seafood here is amazingly cheap. I went back to the hotel bar named Rainbow for one more drink before I went to sleep. I was surprised about how cheap the drink and wine prices were there - only 180,000Vnd per bottle which is much cheaper than in any bars in Hanoi. I decided to order a bottle of Sailing Colombard Chardonnay from Australia. It was good and after half an hour I had finished the bottle and felt a bit drunk. I asked for the bill then went straight back to the hotel room for a good night's sleep. I slept so well and deeply. 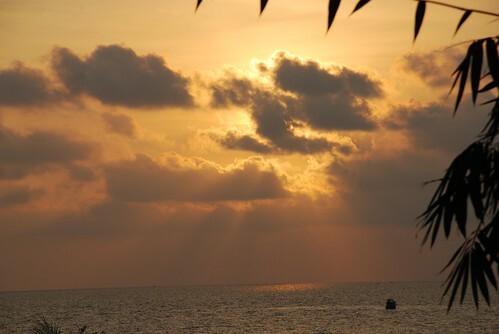 I woke up at 4 am and took a taxi to the airport to fly to Phu Quoc Island. 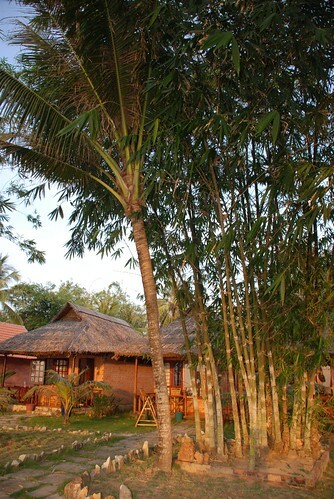 This is one of the hottest places to go at the moment where tourism is not too developed yet. Most of the beaches here are clean with white sand and blue water and not big waves. Anyway, it was a pleasant flight and I arrived safely after 50 minutes from Saigon. Thanh Kieu Resort sent a member of their staff to pick me up from the airport and I don't think I could have found the hotel without him, because the roads here are confusing and he had to turn down many narrow lanes with just enough space for a car or a couple of motorbikes. 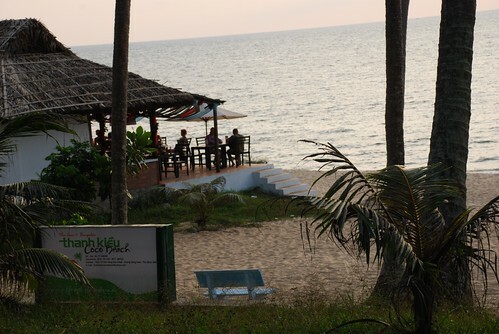 It's really quiet in Phu Quoc at 7 am and everything seemed still sleepy. I went down to the hotel's private beach for breakfast as I had to wait until 11. 30 am for my room. I met a German guy who was also waiting for his room. 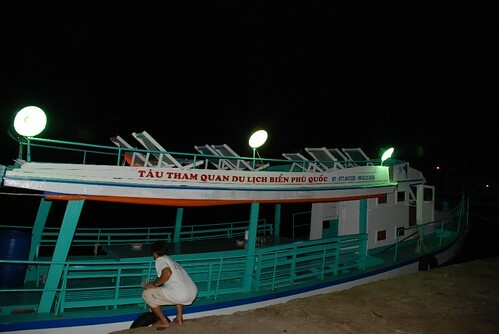 The receptionist came to the restaurant to meet me to give me some travel tips about Phu Quoc and he reckoned that we should hire a cab for half a day to discover the south of Phu Quoc for $15 each and I think that's not a bad idea. I agreed with that and started the trip with the stranger from Germany who is not really fluent in English but I was sure we would have a good day. The car came in 20 minutes which was so fast as I thought it would take him at least 45 mintues to prepare. 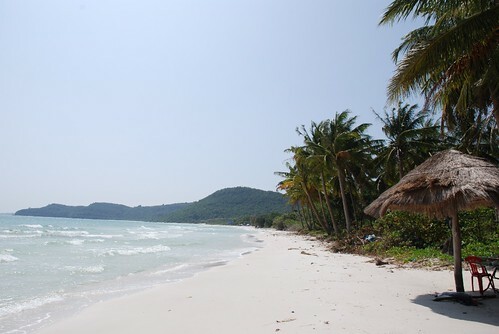 The diver was a really helpful and friendly man as he gave me all the information about Phu Quoc, where to go after the tour, what to eat and where are the best and cheapest places to eat, and any other places of interest. 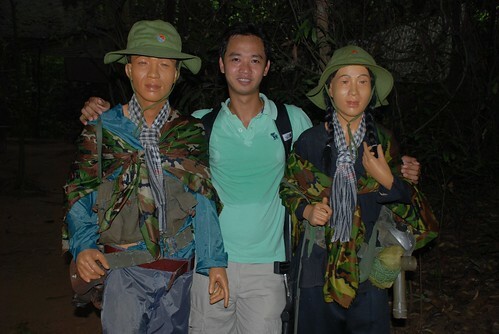 While I was in the south, I took a day tour with Sinh Cafe to the Cu Chi tunnels and the Cao Dai temple. It cost me 80,000Vnd not including lunch. I was really impressed with the professional staff from the ticket sellers to the drivers and the tour guide. They were really helpful and sweet even though this is a cheap big tour group. The tour guide, Mr Truong, who is about 50 years old, is very funny, calm and full of interesting information about our destinations. We stopped over at a workshop called Workability International for 20 minutes to check out the charity organization that helps people who suffered disabilities during the war( lost arms, eyes..) They made beautiful products such as eggshell paintings and lacquerware. It's an example of a charity doing a good job giving people skills to earn a living. 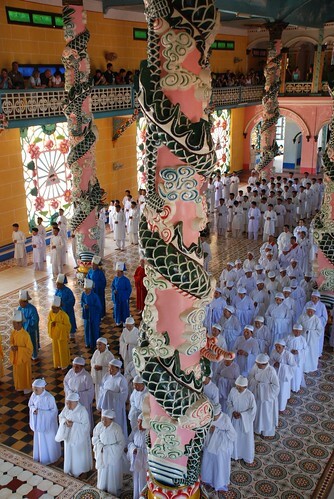 After a ninety minute bus journey, we arrived at the Cao Dai Temple. This is a really interesting place with a unique structure and interesting history. The building is an interesting mix of Catholic, Buddhist and Hindu architecture. 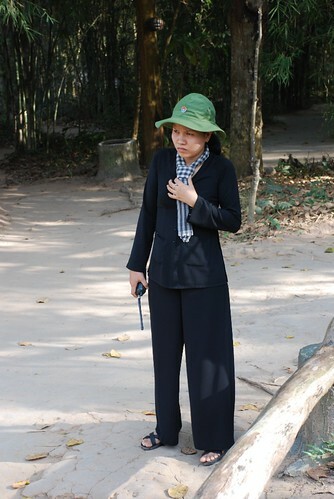 After the first half day visit Cao Dai Temple, we continued our trip to Cu Chi tunnels where the tour showed us how Vietnamese soldiers lived deep underground during the war. Everyone on the tour tried to go through the 60 metre tunnel but I didn't because I did it last time. There was an old couple from the US on the tour and they were surprised to see all of the very simple guns, narrow tunnels and the man said "That's why we lost". The whole group laughed out loud. The people on the tour were very friendly, the guide was very helpful and sweet . Thank you very much for a good day. I got an invitation from my good friend, Michelle to join her on a trip to Huong Canh village for a weekend trip. We met up and joined a group of about 15 people most of who are housewives and people associated with the group, Friends Of Vietnam Heritage. It sounded like an interesting day, something different. 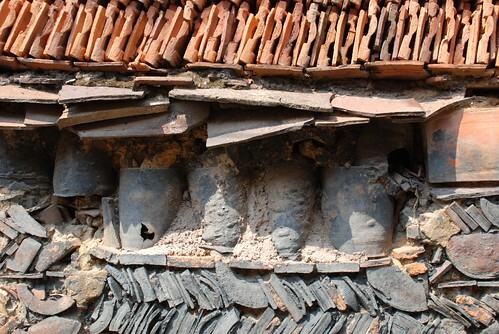 Anyway, we headed by bus to Huong Canh village, one of the oldest ceramic villages which I hadn't heard of before. It used to be really famous for Chum: earthenware or Vai:stoneware, specialising in water jars and cylindrical jars which are used for water and rice. Nowadays, they have stopped making those famous Chum and Vai products, turning to a craft village like others around to focus on fine arts and decorative roof tiles. 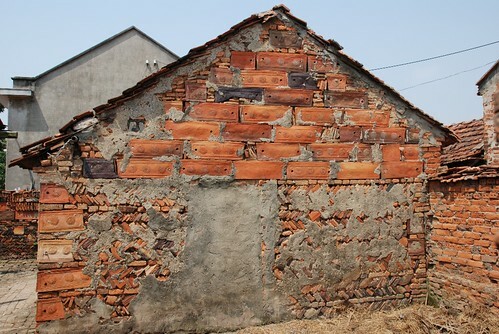 Huong Canh village used to have a lot of red brown clay but it started to run out. Then their product prices dropped to almost half price because everyone was making the same stuff in large amounts and demand for the traditional tiles stopped. Making the tiles also caused a lot of pollution with 70% of the villagers having some kind of health problems especially lung diseases. 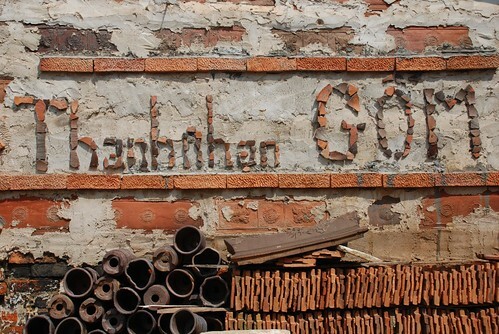 We went to visit the Thanh Nhan workshop which belongs to Mr Nguyen Thanh. He told us lots of interesting facts about the village and his work. 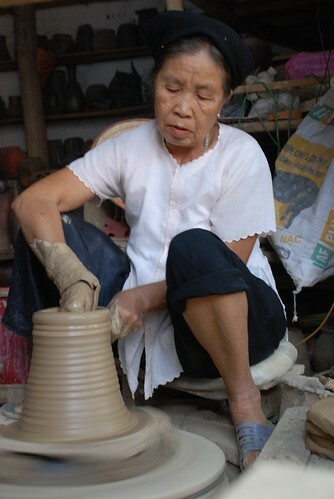 There are so far three generations of his family who have practiced the ceramics craft. 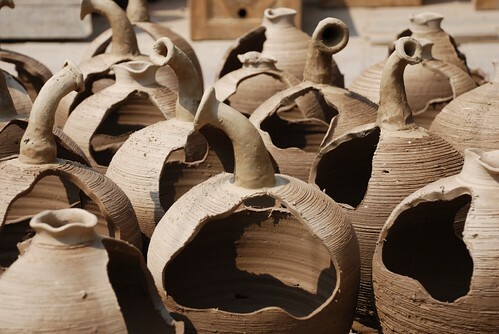 They dig clay from under the lake in the village and let it sit for six to eight months then use a mix of 70% green clay and 30% brown clay so that it won't crack or split and also won't shrink when fired. He also told us that there are only four families left doing this kind of craft out of 103 families in the village. Most of the stuff they make now is for export with special orders from foreign companies in places such as Korea, Japan and even from Europe. 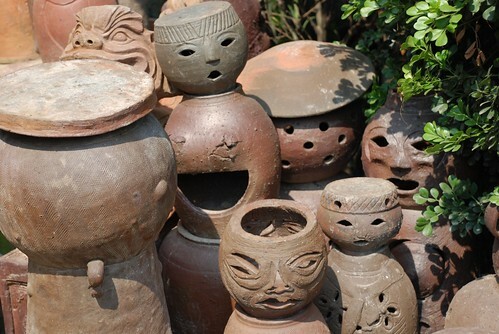 His family has about 50 clay products to choose from and a certain amount of interaction between the family and some enterprises in Bat Trang Ceramic village. Also, people living in this area also use their traditional products in strange ways such as using clay coffins to make fences or house walls. For us, these coffins are usually only used for the bones of dead people. The village also contains many old houses with small gardens including lots of fruit trees which reminds me about my hometown. The people in Huong Canh village are really sweet but the streets are a bit smelly because of all the dog poo around. A small funny story occurred on our trip when we bought a few small ornaments for the house. Some of the couples on the trip bought some big pottery buffalos and they said they were too heavy and they couldn't carry them to the bus. The ceramic family said, no problem, they would bring the buffaloes to the bus. We all walked out of that shop to look at the little pagodas and temples around and as we stood in front of the pagoda, an old lady about 60 years old walked past carrying 5 huge clay buffalos. I said, wasn't it funny that the big strong western men couldn't carry them! They didn't say much of course!!! Anyway, we had a great day, saw a very interesting new place and bought some nice and good stuff. Thanks to Michelle for inviting me.